The OCMC's mill at Taracol, circa 1910. Did you know the Konglish word nodaji (meaning valuable bonanza) is often associated with the Western gold mining concessions of the late 18th and early 20th centuries? The common belief is that nodaji evolved from a frequent command issued by the Western supervisors to the Korean miners not to touch the gold ― "no touchee." I believe this is only partially true. The gold generally found on the concessions was obtained from crushing rocks into powder and this was then mixed into a chemical slush and extracted as gold dust. This dust was then smelted into gold bars. Very few people ― let alone a common miner ― had access to these gold bars or the crates they were transported in. 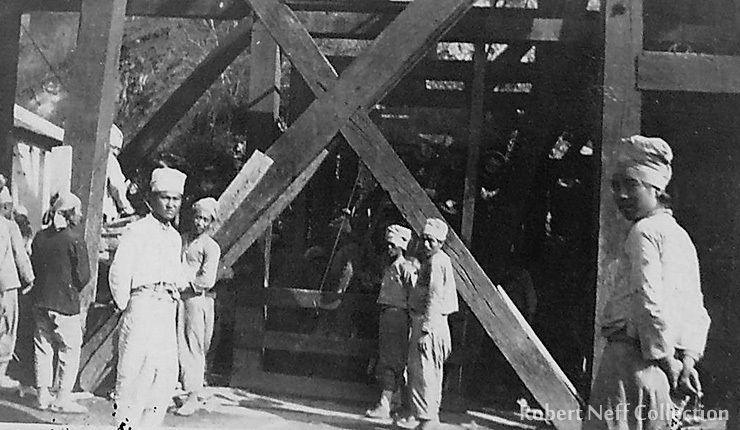 Most Korean employees worked in the mines where dynamite, blasting caps and candles were used in great quantities. These items were highly prized and often pilfered by unscrupulous workers ― I believe the crates containing them were probably stamped "no touch" and it is from here that the term originates. These items were often hidden in the miners' voluminous clothing or even in their long hair and smuggled out and sold to Korean placer miners near the concessions. While the loss of candles and nails was relatively minor, the theft of dynamite and blasting caps was a serious matter as evidenced by the frequent communications between the concessions and the Korean government. In the beginning, the concessions used the miners' superstitions to combat theft. To recover some stolen supplies, a couple of the supervisors at the American-owned Oriental Consolidated Mining Company (OCMC) took an old gramophone and had an interpreter record a message in Korean that an evil spirit would haunt the graves of the ancestors of the men who had stolen supplies from the mine. The only way to avoid this haunting was to return the items. The supervisors then hid the gramophone in the mine and, under the pretense of having to do some work in another section, left. Soon the haunting message filled the air, startling the miners into thinking a ghost was warning them to amend their ways ― within 24 hours all that had been stolen was anonymously returned. The gramophone was also used at the nearby English mining concession ― commonly known as the Gwendoline Mines. Many of the Korean miners were so convinced that evil spirits dwelt within it that they refused to go near it. In 1902, the OCMC resorted to more conventional means of combating theft among the miners. Whenever a shift ended, the Western supervisor would physically search his miners prior to them leaving. This had a huge impact on the loss of supplies and became a common practice. While the mines were the most likely areas for goods to be pilfered, other places, such as the mill, also suffered losses. At one of the OCMC's mills, there was a Western supervisor known as Patch-eye Pete. We don't know how Pete lost his eye, but it is clear that he was unwilling to lose anything else. According to the account, at night, just before leaving for his quarters, Patch-eye Pete would place his glass eye on a table, clearly visible to all of his staff in the mill and warn them that if they tried to steal anything while he was gone, he would know about it through the glass eye. He would then slip his patch over his empty socket and go to his quarters confident that nothing would be missing in the morning. Theft in the mill was curtailed until one day he returned to find everything gone ― including his eye. It was only after a careful one-eyed search that he found his missing glass eye covered with a cup. "Freed from the metempirical gaze of the orb, [his staff had] retrogressed to their thieving practices."